As not all readers may be familiar with you, how would you like to introduce yourself? My name is Natalie and I am a singer/songwriter who lives in Vancouver B.C., Canada. Music has been my greatest passion and joy since I can remember and I'm so grateful to have the ability to share it. Your album is called ‘Fly to home’. What made you chose this title? The songs off of my album "Fly To Home" tell a story of a very important part of my life: leaving behind my childhood, becoming a grown woman and overcoming the hardships of loss and experiencing the true impermanence of life. Fly To home, for me symbolizes traveling through the difficult times in life and reaching the self-knowledge of one's true home, which rests deep inside each of us. Natalie after our initial contact pointed me to a few fellow Canadian artists. Tim Claridge and his band Death Goldblum and King Karoshi. Hence my question: From our previous contact I’m under the impression that you seem to easily find your way in the music scene of your cities of residence. How do you go about finding your way with fellow musicians? For me, supporting other musicians is a huge way of connecting with them. Supporting them by going to their events or supporting them by sharing & playing music together. Most of my dearest friends are people who I play music with, it's the main way I find I can connect with people. You live in Vancouver. Does the city agree with starting musicians? Vancouver is a busy place, very populated and busy, so as a starting musician, it won't be enough to play typical cafes and bars. A starting musician must create their own connections and be creative with the venues they play and find a way to stand out above the rest, otherwise they'll remain in the musical shadows of this chaotic city. Many restaurants, bars and cafes have live musicians playing on all nights of the week, there are tons of open mics and the festivals in the summer in Vancouver and greater Vancouver are abundant, so its takes a strong determination to stand out and be remembered as an artist. My favorite part of the music scene here are the places you'd least expect a live musician to play. An example, The Blue Vine House which is a popular local musician venue here in someone's back yard garage, which invites small bands to play, charging a door price by donation. Another example is Live Music Classes at Moksha Yoga. I have been playing at these yoga studios across Canada for 7 years. Each of the studios have live music nights where a teacher silently guides a hot yoga class while a musician plays relaxing music in the corner. Its an amazing way to stand out as a musician and connect on a deeper level with your audience as they are becoming vulnerable and peaceful in their yoga practice. The guitarist on your album, Tim Claridge, plays totally different music than you do when on his own. How did you find out he was the right musical partner for this album? I've known Tim for quite a few years as when we first met he was my singing student (when I used to give voice lessons). It became our routine to ask the other to sing or play on the other's solo albums as we always had a strong musical chemistry whenever we jammed together. We mutually respect the other so much as musicians and I can't think of anyone else I would have wanted more to play on my album because he understands me and my music the most. Although our styles are so different, like a Yin Yang, we fit together perfectly. On the Internet you can be found playing with other people as well. What constellation do you prefer and when do you know where a song should go, solo or else? The way I write is always changing, depending on who I'm playing with. I am easily inspired by the person I'm playing with and then I go and write a song specifically tailored to fit the type of style they are into, mixed with my own style. I have no preference though, for me the music is so special to me whether I'm playing a solo folk tune, or if I'm in a full rock band. You were influenced by music from early youth. What did you listen to in your youth and what are your influences in 2015? When I young, female artists such as Sarah McLachlan, Alanis Morisette, Celine Dion, the Wailin Jennys were my main source of inspiration because I was a young female singer. As I've grown though I've come to appreciate a broader spectrum of music and this past year my main sources of inspiration have been artists such as Mark Lanegan, Tom Waits, Radiohead, Alice in Chains, Lana Del Rey, Ludovico Einaudi, Yann Tiersen, Johnny Cash, Robert Johnson, Florence and the Machine, Sonny Terry & Brown McGhee are some of the most recent inspirations. What is the story behind the beautiful album art? I painted this peacock, for my father a few years ago after he asked me to paint him something colorful for this apartment. 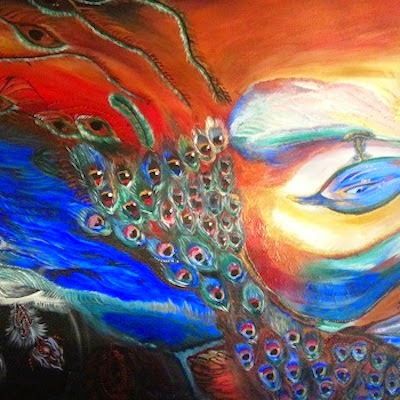 While writing the songs for Fly To Home, I realized the common theme of birds in the songs I was writing, so this painting of the peacock was a perfect fit. In writing about the album after its completion, you hint regularly at difficult times while you were writing the songs. How did you get back on track and do you have to get yourself into the mood of writing? It's easy to write when you are going through difficult times because its an easy release of emotion and expression. It can surely be difficult to get back into writing when life seems easy and happy, but my rule is that I don't force it. If I can't write something good, then I just write something bad and eventually something good will come out. The trick is finding new inspiration! We are lucky, in this day in age, to have access to so much music out of the millions of musicians in this world on the internet…so finding inspiration to write new songs has always been easy with this tool. In ‘Broken mirrors’ the mood changes abruptly. “He screamed ferocious lions” you sing, just after you sing “you know I love you so”. Where does the inspiration for this huge contrast come from? That the interviewer is not perfect is proven by the fact that he heard Natalie sing "He screamed ferocious "liar"". In fact she sings "lions". This made the question a bit different. I'm glad that she liked my interpretation. This is a song written about my mother, whom I have a very lovely and ferocious relationship with. I love and appreciate her so dearly but we have gone through some stages in our lives where we have not agreed on the other's life choices. Broken Mirrors is a representation of the deep love you can have for someone and the horrible frustrating times you can go through with them. Things nature come by regularly in your lyrics. Water, earth, sun. Do you prefer nature or city and in what way do both inspire you? This is a great question that I have been asking myself for a long time. I feel happiest and most inspired in nature, but in the city is where my music is heard and success is found. I am usually writing about nature when I'm dreaming of one day moving out to the mountains and surviving on solar power and my garden, dreams…. In “Here and now” you singing isn’t it time that we start living” as well as “I start living”. Were/are the “we” and “I” compatible? The line, "Isn't it time that we started living right now" is me asking all the people in the world who are stuck worrying about the future and past, can't you just live in the moment and be happy instead of holding on to what you can't control? And then then second line "isn't it time that I start living here and now" is admitting that I'm not better than anyone else and I too am stuck in that habit pattern of worry as well and realizing that I need to start finding a way to live in the present moment. Saying "we" is a just a reflection of how I'm feeling on the inside, because isn't this what humans do? We judge the outside world on how we're feeling on the inside, so 'Here and Now' is representing that realization when it finally comes. One of the outstanding features on ‘Fly to home’ are the harmony vocals of Ainsley Borus. What can you tell us about her? Ainsley has been my best friend since we were both in the 4th grade. We have been playing music since we were in our early teens and whenever I record or play shows in my hometown (Winnipeg, Manitoba) I always include her as a guest singer at my shows/on my albums when possible. She is an amazing singer and dear friend. Another feature is that one instrument gets a special role in a song. When in the process did the inspiration come for that instrument, whether piano, banjo, cello, etc.? I really love having variety and change in the music I make, because if I only had guitar and vocals going, the songs would sound much less interesting. At the time I had been busking with Juliette and Tyler (the cello and stand-bass player) so it was easy to hear what was needed for each song and get them playing for me. I'm also very lucky to have a father that plays the banjo, so when writing I often write something that would fit well with banjo so I have an excuse to ask my father to play on it. You state that you see your music as a gift. At the same time you have to make a living. How do you rhyme these two opposites? Music is a gift because it has offered me so much healing, and I see that if offers many other people healing a sense of peace when they listen. I truly believe that gifts should never be given when you are expecting something in return. I often say "I am a musician" but I would never say that my "career" is a musician. I like to keep working for money and expression of music separate so I work side jobs in other fields. I do make some money from music and it is greatly appreciated but my rule is that I am never sad, if I don't make money from music. Finally, how do you score two hits in the Philippines? This would be thanks to my father. Years ago he travelled to the Philippines with his wife to visit her family and during that time, he brought my old CD to some radio stations and one in particular really loved my music and gave it a few trial plays on the air. Not too long after, people were calling in to request the songs often and so it made its way up the charts. You can expect a new EP from Tim and I, to be released in the next month or so, with his rock/blues style mixed with my folky soft style of music. We are still deciding on the band name but visiting my website natalieramsay.com will have all the information when it comes out.